All APT pipe spools are manufactured of centrifugally cast MONDI™ pipe with the proper heavy wall thickness and special Hi-Hub threaded flanges. Spools are manufactured in accordance with ANSI standards A21.51 and A21.15. Maximum spool lengths for 3″ (80mm) through 6″ (150mm) size is 19.5 feet (5944mm). 8″ (200mm) through 30″ (750mm) sizes have a maximum length of 17.5 feet (5334mm). Flanges have ANSI 125 psi bolt patterns or other standard patterns. 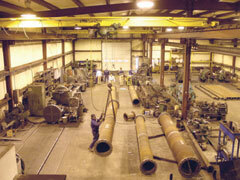 Pipe is cut to the required length and threaded to exacting tolerances to match each flange thread and taper. Flanges are tightened to a specific torque for leak-free pipe-flange thread seal. Flange centerlines and bolt holes are aligned to proper position in our custom machine. 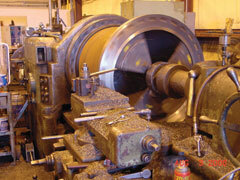 Spools with special flange rotation are aligned in this machine which eliminates errors. Flange faces and end of pipe are machined flat and perpendicular to the pipe barrel with a special phonographic finish. Flange faces are protected with rust preventative and flange covers if required.